CoolBoard is the best piece kitesurfing equipment you can buy that’s built for dry land. The reason? When you ride your board – kite board, wake board, windsurfer, SUP – it moves in all directions, tilting/rocking and sliding. Fore to aft (foot to foot) control is vital, rail to rail (toe to heel) is crucial. 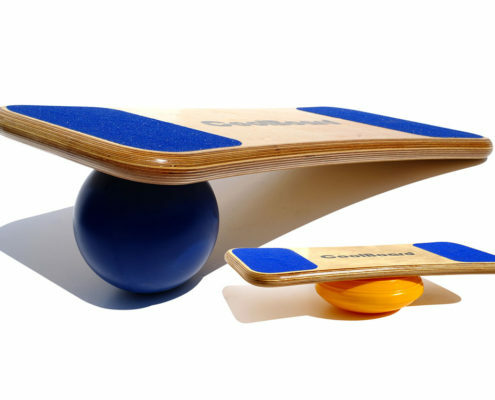 CoolBoard is the only UK balance board that gives you full balance control in all directions, both rock and slide – foot to foot and toe to heel. So if your sport uses a board nothing else will give you the control that CoolBoard training will give you. Beware of lesser balance boards and wobble boards that limit movement, these either rock with no slide, or only slide from foot to foot – the easy bit! You’ll want our full movement. Beginners – get the best head start! CoolBoard exercises are excellent at targeting the areas of strength you need to improve. Wakeboarding, Windsurfing, Kitesurfing and SUP not only require great board control, but also a good level of upper body conditioning. You constantly call on your core and joint strength as well as your major muscles. The stronger your core strength and joint stabilising structures are the more strength, power and accuracy you will have – or to put in another way – SHRED HARDER FOR LONGER! Instability training works these often under-developed areas of fitness, and because CoolBoard offers more instability than all other balance trainers its more effective. On a CoolBoard you must react to every little movement in every direction, constantly working all those important muscles. As a kitesurfing equipment goes, it simply can’t be beaten. Wakeboarding, Windsurfing, Kitesurfing and SUP all come with risks of injury.